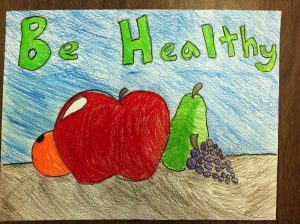 For Sharon Bivens, an art teacher at Birdneck Elementary School in Virginia Beach, Virginia, Nourish provides a way to open a conversation with her students about their relationship to food, as well as the link between art and meaning. Here she describes how students’ newly developed curiosity about food becomes a wellspring of self-expression. Last year, one of my colleagues, a fifth-grade teacher, approached me about a lesson she was planning on the topic of buying local food. The timing was perfect, as I was starting an art project on the same theme. After ordering the Nourish: Food + Community DVD, I found the content so student-friendly that I was sure it would engage my students. Since I often integrate environmental issues with art lessons, I challenged my students to create their own “Buy Fresh, Buy Local” bumper stickers. By incorporating environmental issues in art classes, students become better “Earth stewards” and they learn to love and protect our many natural treasures. They also discover how artists apply their passions to create meaningful art. To initiate the project, my art students first watched the Nourish DVD. The video generated many questions about our relationship to food. Then, students looked at “Buy Fresh, Buy Local” bumper stickers from other states. We studied the work of artists who communicate about social and environmental issues. Finally, the students designed their own bumper stickers. The project was a big success. However, one student said that she was disappointed that the art was not really going to become a bumper sticker. This year, I turned the project into a contest. The winners will have their images printed on canvas grocery bags and bumper stickers. All students will have the option of putting their images on canvas bags through the “Original Works” fundraising program we do at our school. I love the simple beauty of the Nourish DVD and it proved captivating to my students.